Thanks for stopping by again today. Yes, I've been a busy girl.....especially for someone who isn't even in town as this is all going down. I've had several posts scheduled and ready to go while I've been away. Some are for my Design Teams assignments and other special projects I'm taking part in this month, and then there are those posts that are just for fun...like this one! Clearly, this card is nothing really special. 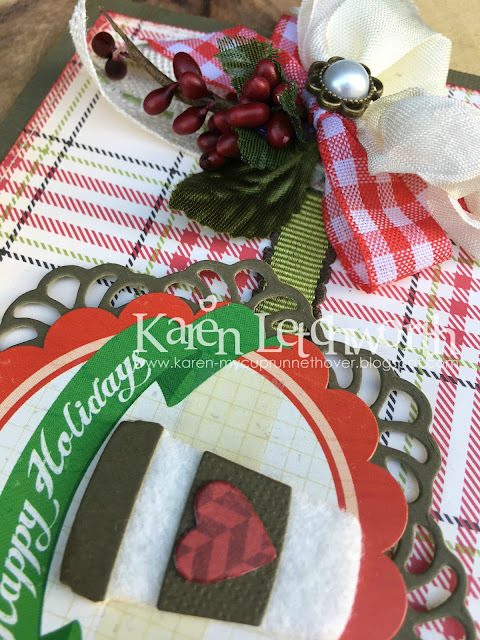 I started with a dark brown Bazzil cardstock base and added a piece of a Christmas plaid from October Afternoon. I cut a doily die-cut in the same dark brown cardstock as used on the base, and that's topped with a Crate Paper Happy Holidays scalloped circle sticker. I ran a width of green ribbon across the card. There are two Wild Orchid Crafts 15mm Green Mulberry Leaves tucked in there, as well as and the coffee cup was cut from ivory wool felt using the Little Bits - Coffee To Go made by Taylored Expressions. I also added some Cream Seam Binding, Green Center Stitch Burlap and a 14mm White Flower Shaped Flatback Round Pearl Accent. I hope you'll stop back by again later today for my Paper Sweeties post. I will be sharing a SUPER SWEET Paper Sweeties coffee-themed card that you won't want to miss. I really do appreciate your visits, and it really is sweet. I'd love to have you swing back by if you can. Winter Coffee-Loving Cardmakers Blog Hop - Anything Coffee, Tea, or Cocoa Related with a Winter Theme. This card uses the cute die-cut called Little Bits - Coffee To Go made by Taylored Expressions. Great coffee cup with the Christmas colors. You are really going to town with a lot of creations. Superb one, love this beautiful card with all layers! Gorgeous layout and beautiful card design. LOVE your felt coffee cup! I miss October Afternoon! Gorgeous...love the colors you used. Karen, this is gorgeous. I love the leaves and berries. beautiful card. Love the sprig of berries. great rich colors on your card. Love the look. always love seeing your inspirations. Um.. nothing special? Love this.. beautiful! Love the design and that gorgeous cluster of flowers not to mention the cute felt cup! Another pretty card! 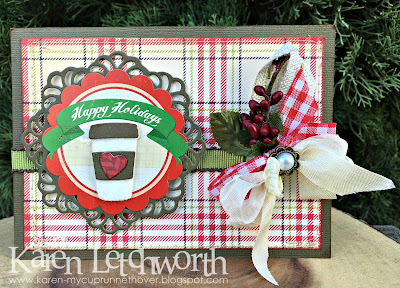 Love the felt cup and the plaid paper! Thanks for hopping along with us! So festive. Love the use of felt. Lovely card and great embellishment.